ESACT offers an introductory intensive course in cell culture produced viral vaccines to meet the needs of the rapidly expanding research and development in academia and industry in the field. This course introduces the basic principles of vaccination and manufacturing of viral vaccines. Also, the course will provide an overview of the advanced strategies to respond to the challenges of new and established viral infection diseases. The course has been designed to benefit those starting their research activity in this field, both from Academia, Industry or Public Health Agencies. 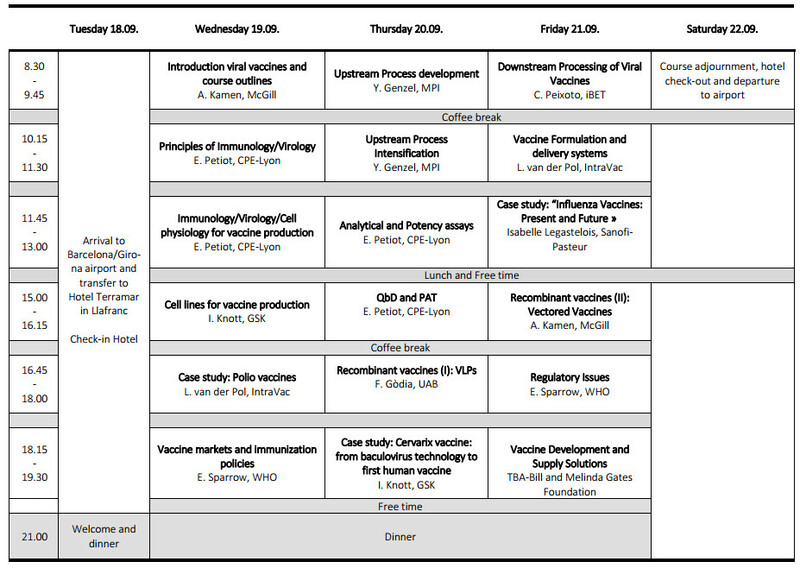 It is also of interest for those wishing to up-date their knowledge and know-how in cell production of viral vaccines. A limited number of grants, covering the course fee (not travel cost), are provided by ESACT. Applicants to the grants should indicate it in the course application, together with a motivation statement. Priority will be given to young PhD students from Academia. Inquired lecturers: Amine Kamen (McGill, Canada), Reingard Grabherr (Boku, Austria), Leo van der Pol (IntraVac, The Netherlands), Yvonne Genzel (MPI, Germany), Francesc Gòdia (UAB, Spain), Cristina Peixoto (iBET, Portugal), Patricia Leung-Tack (Sanofi-Pasteur, France), Emma Petiot (CPE-Lyon Engineer School, France), Isabelle Knott (GSK, Belgium), Erin Sparrow (WHO, Switzerland) and Ray Prasad (Bill and Melinda Gates Foundation,USA). Other information can be found in www.esact.org. McGill University. 817 Sherbrooke St. W.
The course will be held in Hotel Terramar, a three star hotel (http://www.hterramar.com) in a small town named Llafranc in the heart of Costa Brava, Girona, Spain. The hotel is right on a very nice sandy beach, providing a cozy and relaxing atmosphere for the participants. Weather in Llafranc at this time of the year is generally pleasant. In general, participants will be accommodated in double rooms. But participants have the possibility to be hosted in single room (limited to availability) at an extra cost of 125 Euros to be paid directly in the hotel. Travel organization to the meeting site is of participants responsibility, ensuring their participation to the full Course. Access by road from Girona airport (30 min) or Barcelona airport (90 min) is suggested. Detailed and updated programme for 2019 will be announced shortly! For your information please see the programme of 2018 course below. 1000 Euros for academic participants and 1600 Euros for industry participants. The fee covers course registration and materials (ebook), accommodation in two-bed rooms (shared with another participant), meals, transportation from/to Barcelona airport with one organized bus transport service at a fixed time. Participants will be informed right in time to arrange their travelling accordingly or alternatively arrange for their transportation on their own. By compiling and sending this form I agree that my personal data are stored for the purpose of processing the registration at ESACT e.V. This consent can be revoked at any time by sending an email to office@esact.org. The revocation does not affect the legality of the processing so far. You need more information? Anything you’d like to tell us? Copyright © 2017 European Society for Animal Cell Technology. All rights reserved.